I arrived in San Francisco early Friday, November 4th, before registration opened up. It was great to have a chance to settle into a hotel room and more importantly, meet Krystal of Mrs. Regueiro's Plate. When I met her, it was like we've known each other for years. It's crazy how much we share in common and in some ways, she's very much like a sister from another mother. We decided to take a cable car down to the infamous Fisherman's Wharf and enjoy lunch at Boudin. We both had the popular clam chowder in a sourdough bread bowl (yes, I cheated with gluten laden foods, but how could I not?!) It was so worth it and although it was amazingly good, I could only handle so much sourdough. Next, we took a walk to Ghirardelli Square. It was quite a walk and climb up stairs but once we got to Kara's Cupcakes, we were in cupcake heaven. I was thrilled they had a gluten free vanilla cupcake so I took advantage of that - so good! But we can't forget the highlight of Ghirardelli Square... Ghirardelli Chocolate, of course! Krystal and I opted to have the salted caramel hot cocoa and enjoyed them with our cupcakes. As an added bonus, Krystal got serenaded a gentleman with his rendition of 'I Left My Heart In San Francisco'. I couldn't have wanted a more perfect start to the weekend in San Francisco. 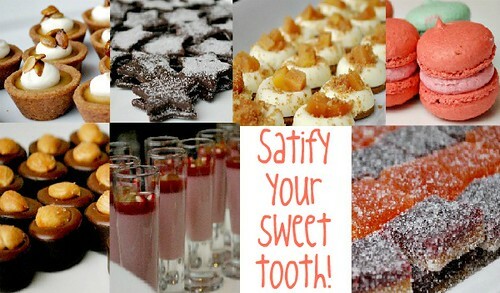 Then it was off to meet the other food bloggers at the hotel. We hopped on the cable car and met up with Nikki of Pennies on a Platter and Jessica of Sunny Side Up in San Diego. I've met Nikki before but it's been quite awhile since we got together since she moved from Chicagoland out to California within the past year. It was so great to finally see each other after many emails back and forth prior to the weekend. Nikki, Jessica and I were roomies and had so much fun! 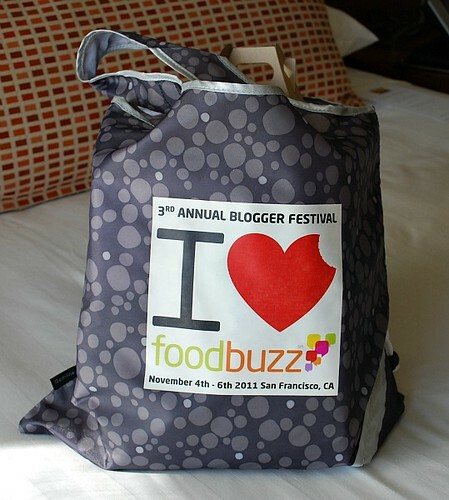 When we got to our hotel room, we checked out our swag bag from FoodBuzz... lots of goodies and some I'll be sharing in future giveaways! So after Nikki and Jessica settled into the hotel room, we met up with Jessica of My Baking Heart in the hotel lobby. 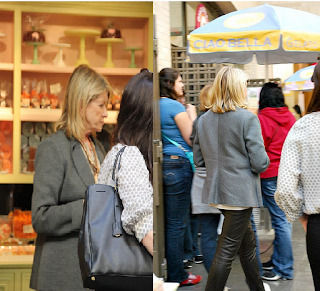 Her mom, Ginger, joined us and together we hopped in a taxi down to the Ferry Building Marketplace for a late lunch. 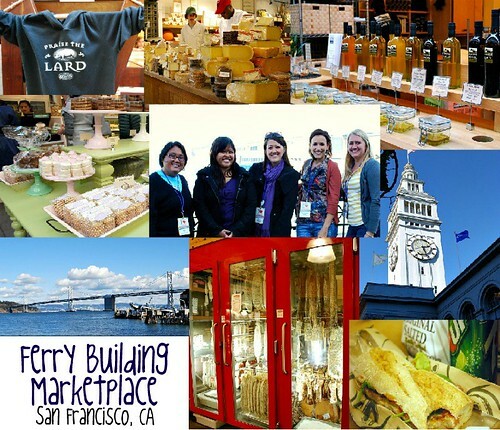 If you've never gone to the Ferry Building, you must go. Like now. 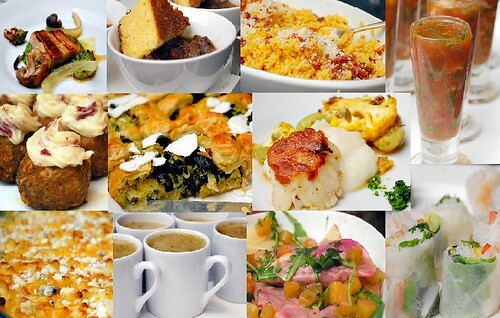 It's a foodie's haven of various artisan eats. From olive oils, cupcakes, cheeses, cured sausages, gelato, and breads, there's something for everyone. I especially loved the gluten free breads of Mariposa which had sandwiches available made with Boccalone Salumeria meats. Finally, I was able to indulge in some fabulous gluten free artisan style breads! After the fun at the Ferry Building, we headed back to the hotel and relaxed a bit before getting ready for the Welcome Reception, Dinner and Blogger Award Ceremony. The reception was sponsored by Sabra hummus so there were quite a few appetizers made with hummus. 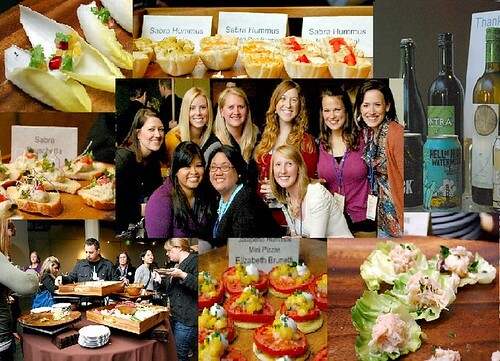 It was also a great time for us to mingle with a few more food bloggers including Jessica of Forgiving Martha, Courtney of Pancakes & Postcards, Cate of Cate's World Kitchen and Courtney of The Granola Chronicles. Another person I got to meet and hang out with was Joanne of Jo Boston is a Foodie. 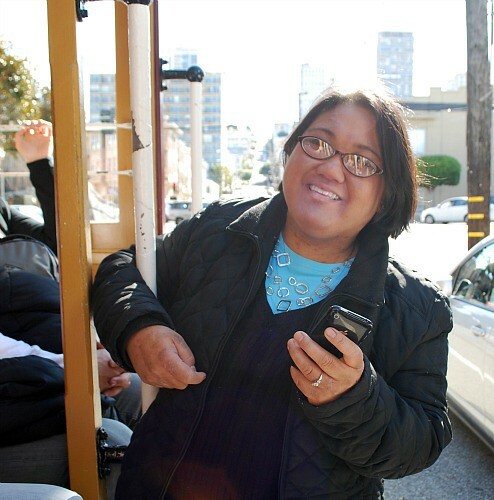 She is part of a Filipino dining group in San Francisco called KapaMEALya and I truly love their focus. KapaMEALya is about bringing family and food together... and in their efforts, highlight the rich Filipino culture and cuisine. 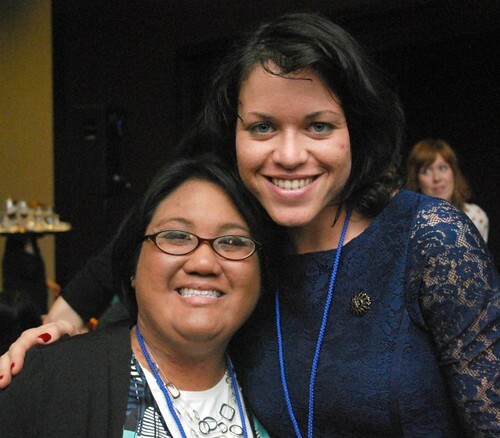 I'm so glad I had a chance to meet her after exchanging a few emails in the past... and she's inspired me to host some Filipino dinner events in Chicago to share the KapaMEALya spirit here in the midwest! After mingling, we all headed upstairs of the Terra Gallery for the reception. What a spread of amazing eats! There were so many things to choose from and I love that they accommodated gluten free diets. I didn't feel like I missed out on anything! 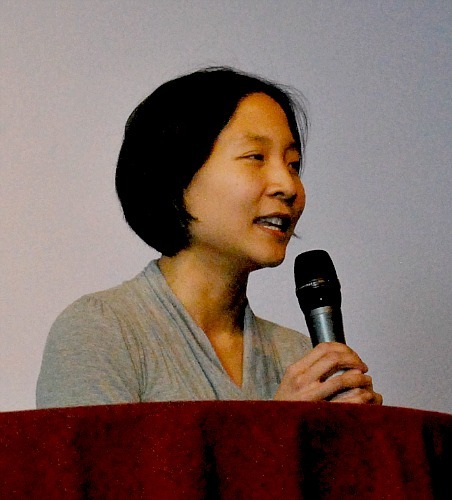 During the dinner, we got to hear from Jen of Tiny Urban Kitchen. She won the Project Food Blog contest hosted by FoodBuzz and she's quite an awesome person. She shared her personal story of how she worked with the less fortunate and when she won the contest, Jen donated her winnings to charity. 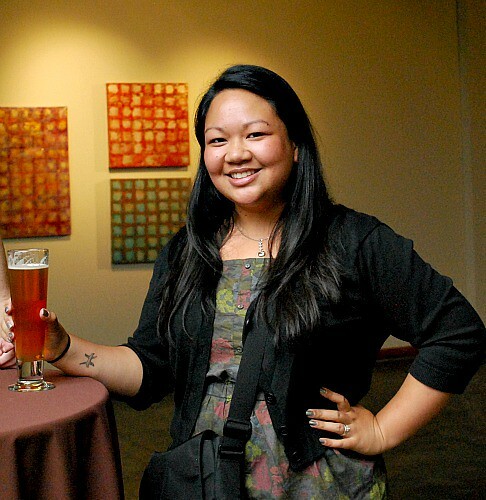 Jen's truly an inspiration aside from a creative blogger! 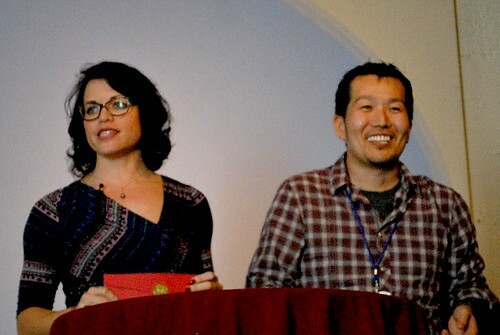 Then the Blogger Award Ceremony took place, hosted by Joy of Joy the Baker and Marc of No Recipes. Various categories were highlighted and I was thrilled when Nikki was nominated for the Best Family Food Blog. Sadly, she didn't win but she'll always be a winner in my book! Then it was time to indulge in dessert. Again, quite a bit of options and my favorite were the macarons. They served as another reminder that I need to get on my horse about making them... like yesterday. I have no excuse either since they are gluten free! So here's where I messed up. The next day, Saturday November 5th, we started the day with a delicious breakfast at Federated Media - the headquarters of FoodBuzz. 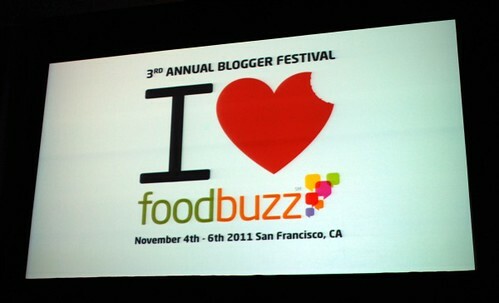 After breakfast, we heard a panel of talented food bloggers before breaking out into group sessions. The sessions were dedicated to various topics related to food blogging including photography, social media, blog design, etc. After the informative sessions, we headed to the Metreon for lunch. 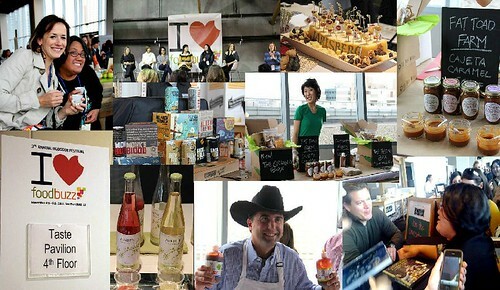 Rather than a typical lunch, FoodBuzz set up a huge 3-hour Tasting Pavilion where food businesses and companies came to provide samples of their products. It was a good event but I wished the expectation was better communicated. Attendees could have benefited from bags to carry the load of samples and goodies we received from the individual businesses. Businesses could have benefited from having a schpeel ready to better connect with bloggers and how they would like to work together. Overall, it was fine but I thought it could have been better executed. Sadly, I forgot my SD card for my camera and wasn't able to take any pictures of either the break out sessions I attended or the Tasting Pavilion. Thankfully Krystal took some great pics (featured below in the collage). However, it wasn't all bad. A special surprise attended and it made everything all better! 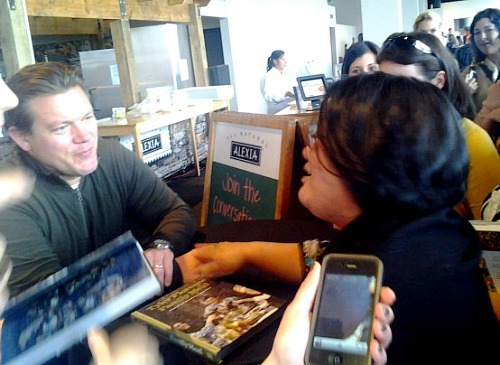 Chef Tyler Florence paid a visit at the Tasting Pavilion and I have to give it up to my girl Joanne for snapping a pic of me talking with Tyler. I even scored an autograph of his latest cookbook, Family Meal: Bringing People Together Never Tasted Better. After such a food-filled afternoon, it was back to the hotel to take care of our food coma. 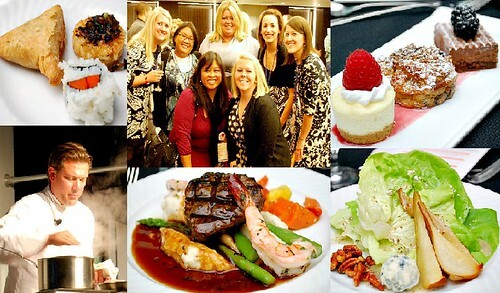 We then got dolled up for an evening at the Gala Dinner, featuring a cooking demo with Tyler Florence! When we arrived at the gala dinner, we noshed on some appetizers compliments of Alexia Foods. We mingled some more with fellow food bloggers including Mara of What's For Dinner and Nicole of Prevention RD and then sat at our table up front. Mara and I have met before since she's just outside of Chicago and Nicole have exchanged a few emails before the festival. It was so great to hang out as a group! We had awesome seats with a perfect view of Tyler himself. The meal he prepared featured thick cut pork chops, braised red cabbage and herb spaetzle. We didn't taste his dish, but I sure was craving pork chops afterward. As for our gala dinner, we feasted on a variety of appetizers, a bib lettuce salad with blue cheese vinaigrette, filet mignon and shrimp, and a trio of San Francisco inspired desserts. Once dinner was over, folks slowly left the gala while us girls pretty much closed out the room! We spent some time chatting with Joy of Joy the Baker and got a chance to know her a little more. She's so down to earth with a fun quirky charm. She's quite an inspiration to many and I love that she's so approachable. It's nice to know that not all 'famous' food bloggers have let it gone to their head or carry a 'holier than thou' attitude. Then it was the finally morning of the long weekend in San Francisco. 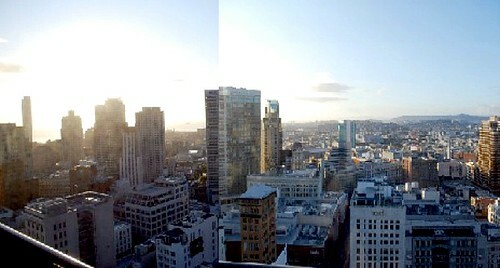 Isn't this such a great hotel view of the city by the Bay?! Ideally, we wanted to attend the FoodBuzz Farewell Brunch but because of the location and timing of our flights, we opted to sit it out. 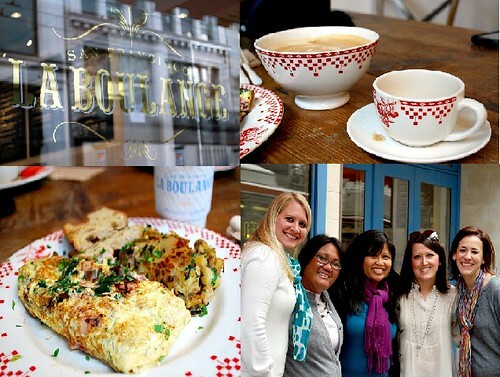 Instead, we got together and had a nice brunch at La Boulange, a quaint little restaurant within walking distance from our hotel. There, we reflected on the weekend over large bowls of capuccinos and coffee, amazing breakfast eats and bittersweet smiles. For some of us, it will probably be another year before we see each other again... and for others, we're anticipating another reunion soon in our local cities. We said our goodbyes to each other after brunch and it certainly was bittersweet. 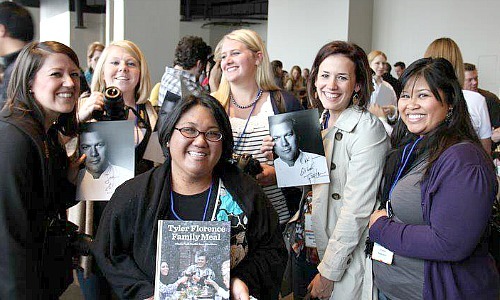 Regardless, from this weekend, we've all made some delicious connections and deepened our food blogging friendships. My flight wasn't until later in the afternoon so I spent the last couple of hours with Krystal and her friend, Yvette. Yvette was a great tour guide of San Francisco and we were able to stop for some pics at a few places. 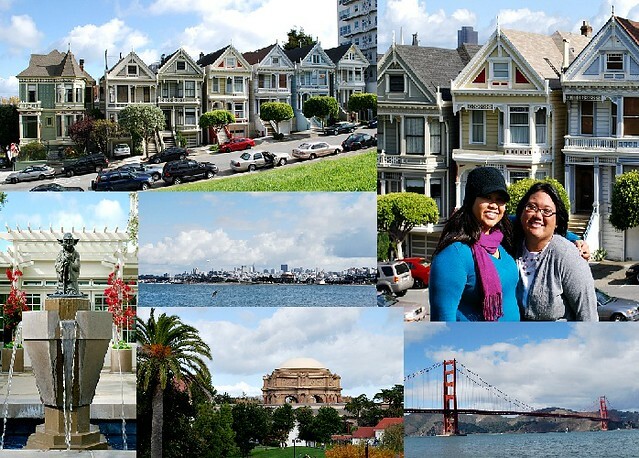 We checked out the 'Painted Ladies' homes in Alamo Square, made famous from the tv sitcom, Full House. We even said hello to Yoda, where we took pictures of the Yoda Statue at the Lucas Films Headquarters. Next was a stop at the Exploratorium and Palace of Fine Arts for more pictures. Then we drove through Crissy Field and took pictures of the city and Golden Gate Bridge. Before we knew it, it was time for me to head to the airport... but not before I picked up some In & Out Burger! Overall, it was an amazing and memorable weekend and I can't wait until next year! Wow! You definitely accomplished a lot over the weekend. Having been there I'm enjoying reading everyone's recaps. Awesome recap, and well-written. I truly hear your sweet voice. Such an awesome weekend, and I'm looking forward till next time. Maybe if you move to Daly City..I'll see you more often. **hint hint!! ** HUGS, love ya!!! Ahhh! I miss you! It was such a blast! I can't wait to hangout in Chicago! I love the picture collages!! What a great way to represent all of the fun we had this weekend!! Do you have a flickr album where I might be able to steal some of the group shots? I just want to say I am SO happy I got to meet you this weekend. It was such a fantastic weekend and I know that was due, in large part, to the company I was with. Finally, why do I look so freakishly tall in our last group pic from the bakery? Haha, Jesse was laughing at me when he went through the pics! Great article and thank you so much for the pictures! I hope that next year I'll be there too!